Hamburger cold record on 13 January 1940 has an anthropogenic cause! During the extreme cold January 1940, the all-time cold record for Poland and the city of Moscow happened in the mid of the month. In Hamburg, a city merely less than 100 km away from the North Sea in the west, and the Baltic Sea in the east, the lowest ever temperature with minus 29,1°C, was measured on the 13th February 1940. Can this be explained and an anthropogenic contribution established? Fact is, that World War II was in the 6th month. 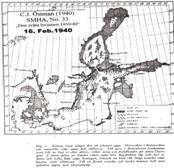 Immediate cause was a reinforced cold air pool (Kaltlufttropfen) around mid January, which was pushed since 7th February from the Baltic region westwards, and centered over Hamburg region on the 12th February (Palosuo, 1953). 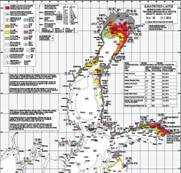 The most likely cause for the move was the exceptional severe sea ice conditions in the German Bight in the North Sea, Western Baltic Sea and Kattegat . By mid December 1939 unusual happened. Since 16th December sea ice formed along the German Bight and remained up to 100 days. That could not really be, because November and early December was mild, cloudy and rainy with predominantly southwesterly winds. It was chilly in northern Germany only between 14 to 21 and 26 to 31 December. In these two periods, the mean low temperature at Helgoland was about -2 ° C, with a monthly average at +0.6 ° C. How could under these conditions sea icing start so early, and to become the worst since reliable data are available since about 1900 (Fig. 1). This extraordinary event requires an explanation. 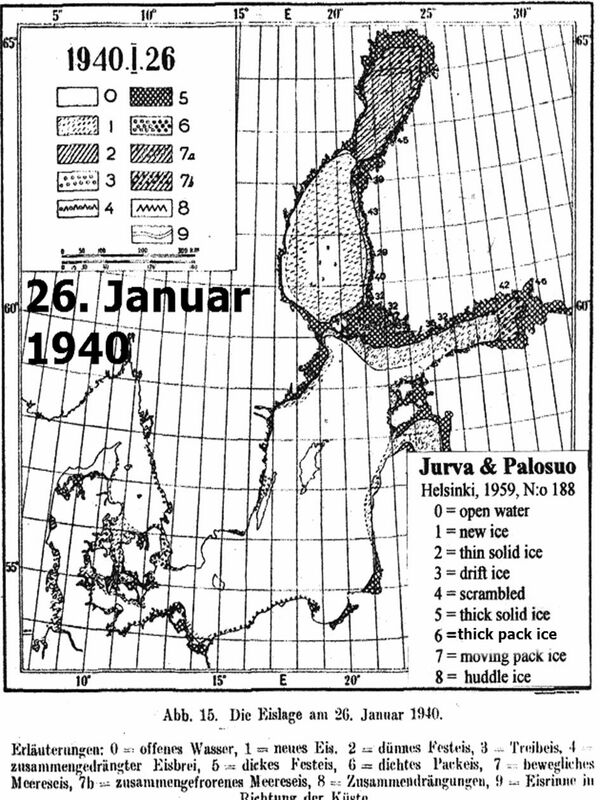 At first some notes on ice development until 13th February 1940. Fig 2 & 3 indicate start and duration at German observatories. 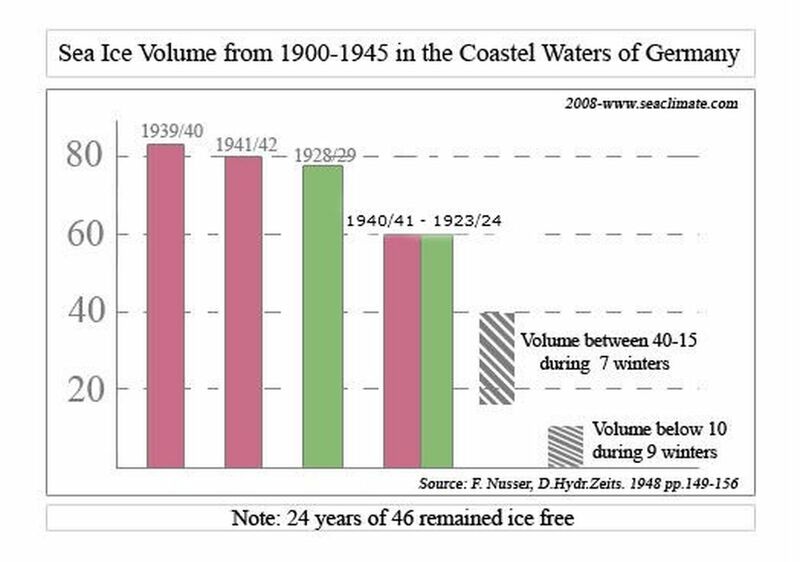 It is worth noting that the ice development in the German Bight began about 2-3 weeks earlier than at the German Baltic coast, e.g. at the island Fehmarn (05/Jan.) and Eckernförde Bay (07/Jan.). 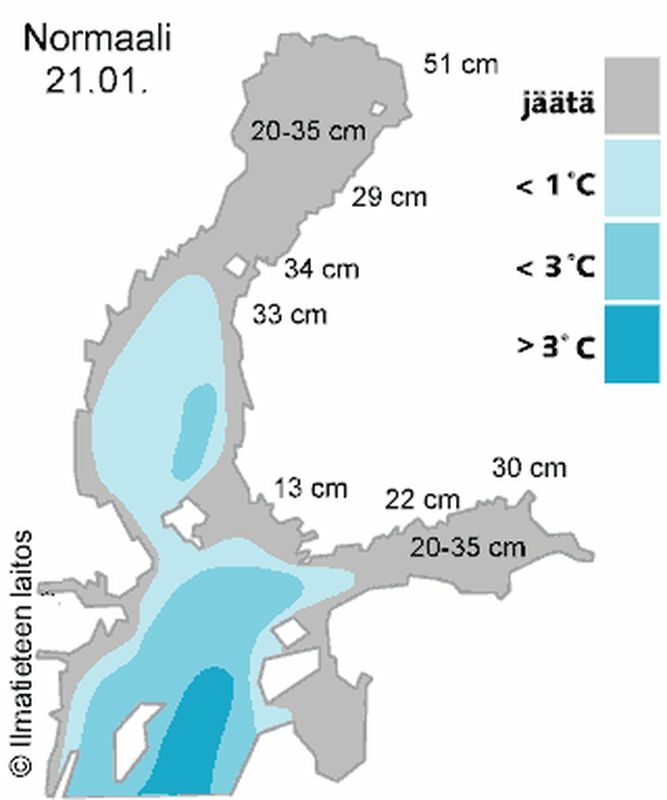 On the 26th January, the Baltic Sea was ice-free for up to the Gulf of Finland, whereas the German coast and the Kattegat already account a significant icing (Fig. 4). 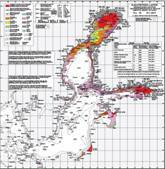 It is to note that the ice map Figure 4 had been assembled by the Finnish Ice Service and does not necessarily reflect the situation in the German waters. 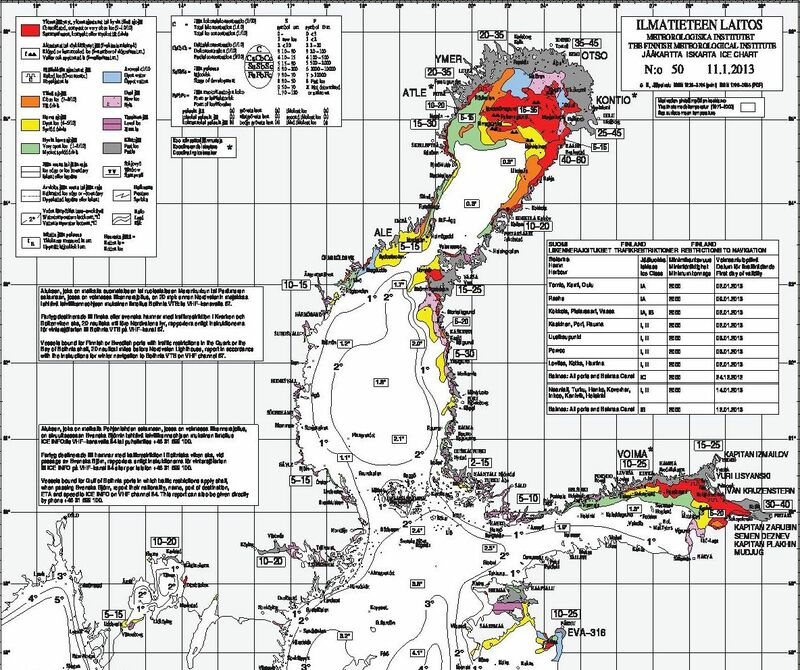 Firstly, all meteorological and navigation relevant data were top secret and secondly, German ice charts are lost. 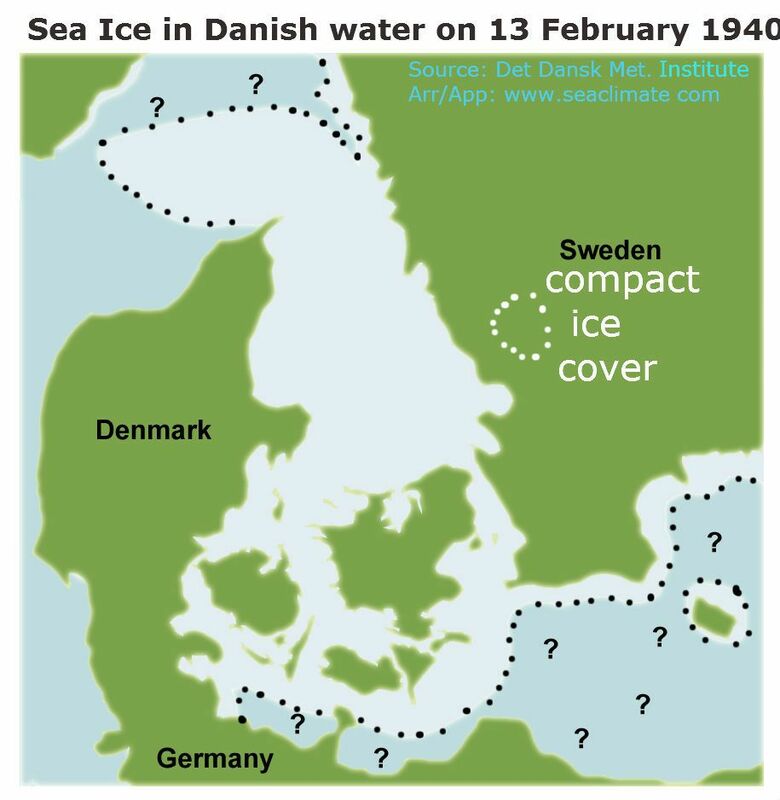 A Danish ice map of 23rd January excludes any details from Germany (Fig. 5). 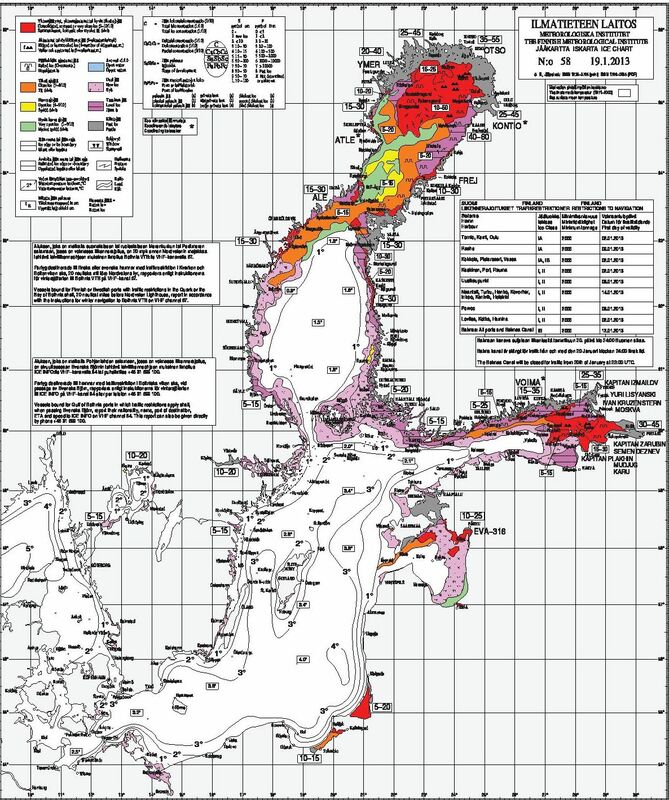 During the next three weeks the Kattegat ice increased strongly as evidenced by Danish ice map of 13th February (Fig. 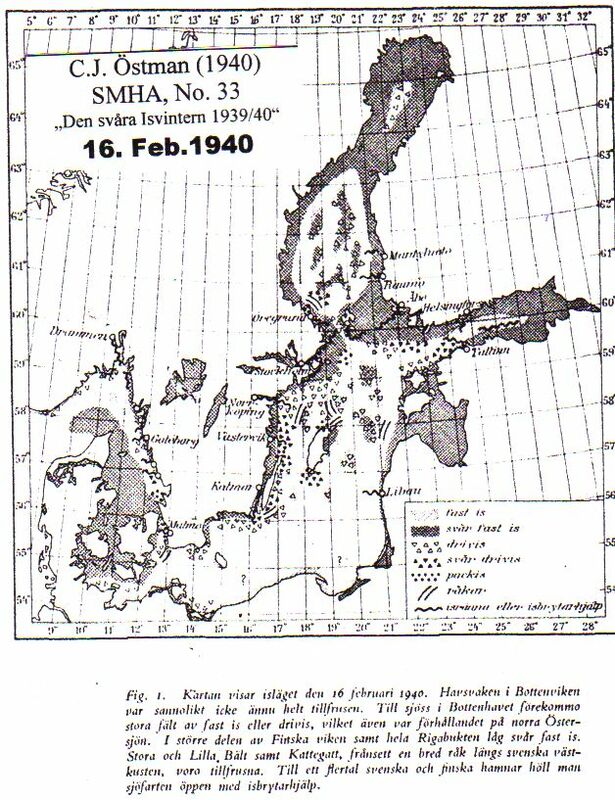 6 & 7), and presumably the same occurred along German’s coast lines, while the south-eastern Baltic Sea east of the Danish island Bornholm is still largely free of ice on 09th February (Fig. 8), which remains at least the case up to approximately the 16th February (Fig. 9). 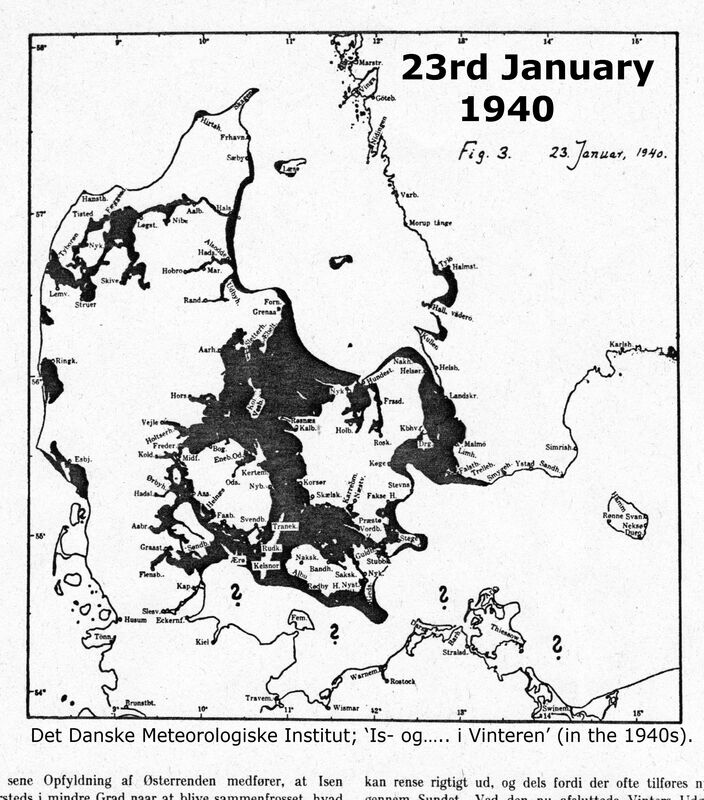 Not until the beginning of March 1940, the Baltic Sea frozen over entirely, for the first time since 1883. The extreme sea ice conditions in west and east of Hamburg are the most promising explanation for the move of the cold air pool to this location on February 13. 1940. 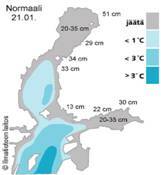 The severe icing conditions in the German Bight and western Baltic attracted the cold air pool towards this region. 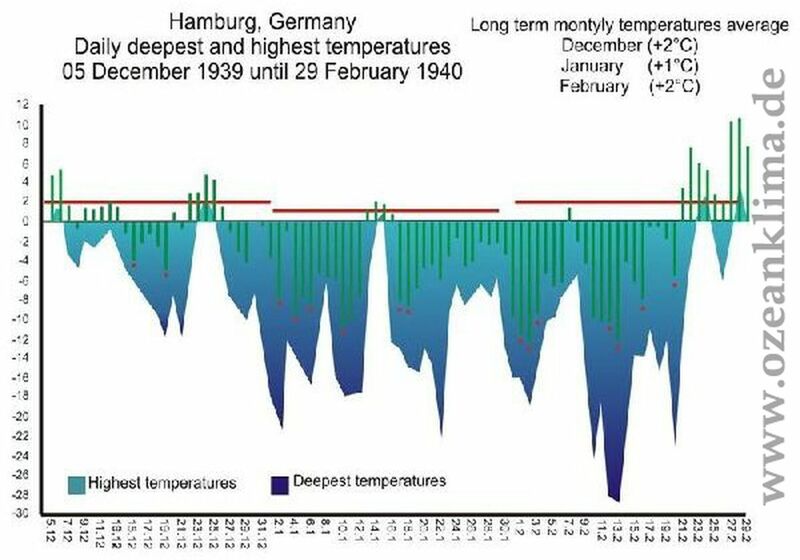 Yet the city of Hamburg was just on the edge of the heavy cold over the Baltic Sea in February 1940, experiencing an extraordinary monthly deviation from average between -4 and -6.9 ° C (Fig. 10). 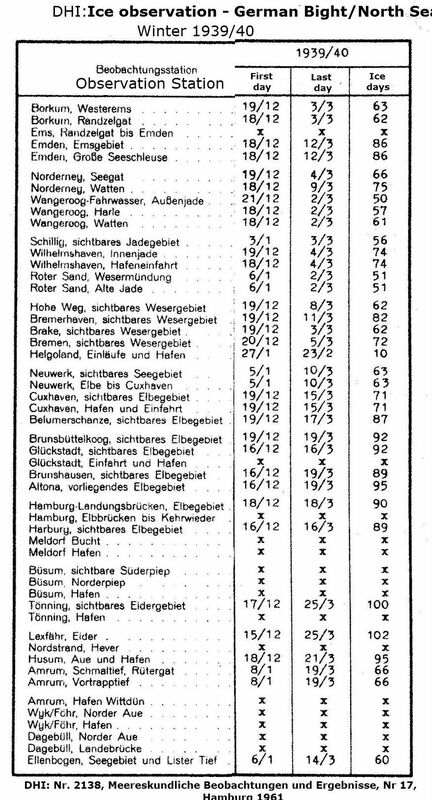 Deviation from temperature mean in Hamburg from Dec.05 to Feb.29, 1940 is indicated in Figure 11, with an all-time cold record on 13th February 1940. The initial meteorological condition for this record can be traced back to principle conditions in first half of December. 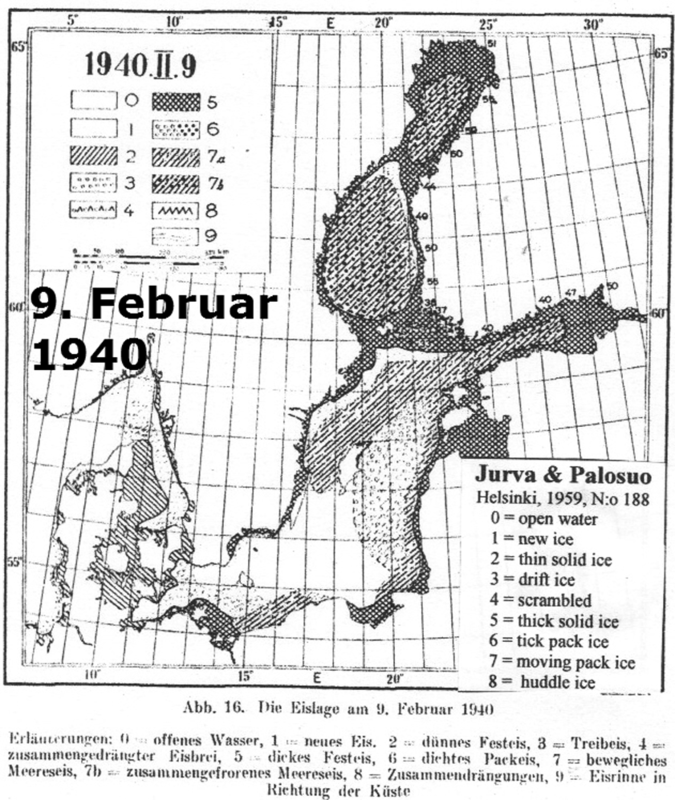 There was early and extremely enduring sea ice under weather conditions within a fairly normal range. The most convincing explanation is that the German coastal waters temperatures must have been considerably lower as in other years. This brings an anthropogenic contribution into play. Since 1st September 1939 large parts of the German Navy operated in German Bight, laid several 10,000 sea mines and were attacked by the Royal Navy ships and air bombers. In the western Baltic naval activities was extremely high too. Heat absorbed during the summer season vanished too early. 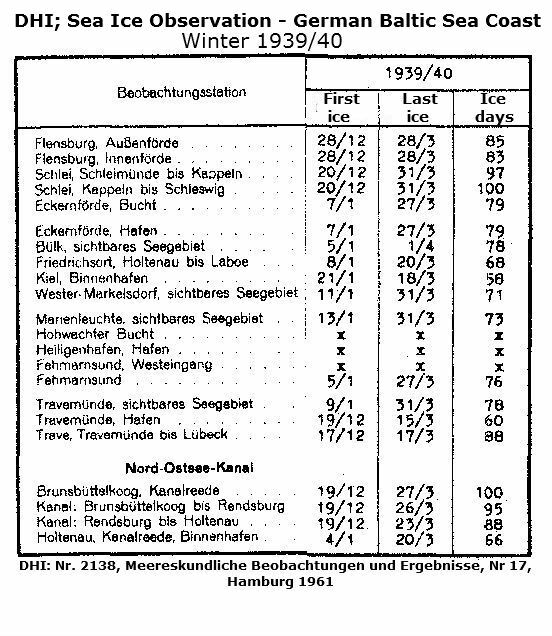 Even a moderate frost period before December 26, 1939 was enough to start a serious sea icing. 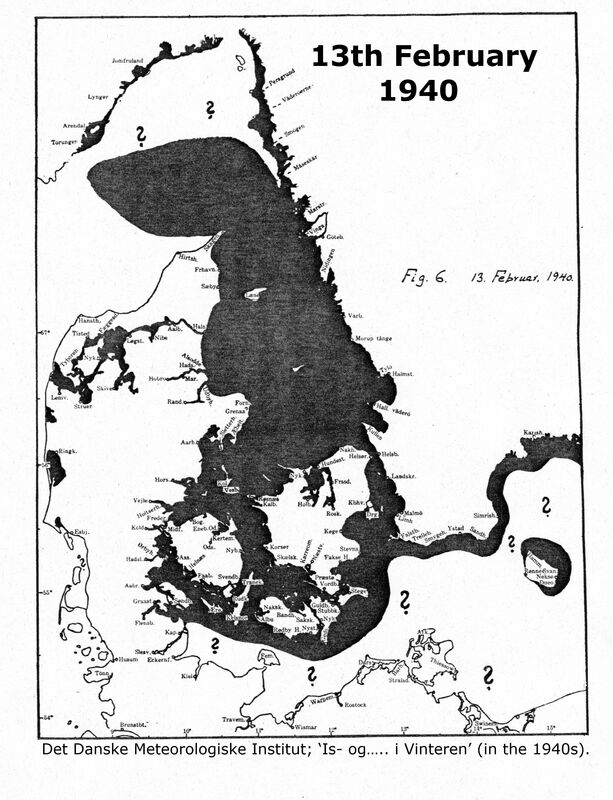 This was reinforced by ongoing naval activities, which contributed to an extreme ice cover along German’s coasts during early February, and thus attracted the cold air pool to the area of Hamburg on 13th February 1940. 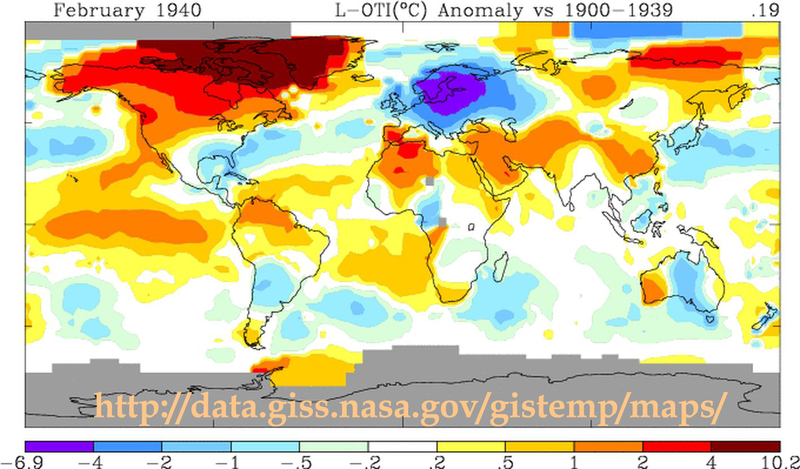 Several regions of the northern hemisphere experienced already very cold periods this winter. Since the end of November 2012 temperatures have been -1.3 ° C below average in China , in the northeast of the country -3.7 ° C. So far it is the coldest winter in 28 years. During a cold period in northern Europe in mid December 2012, significant sea ice appeared in the NE Baltic around 26/27 December (HERE), followed by moderate winter conditions for about three weeks. The sea ice diminished until 11th January (Fig.1). Since then the trend reversed, and has now (19/Jan., Fig.2) almost reached the long-term average (Fig. 3). The status per 14th Jan. is: HERE. Unable to Prevent Climate Change and World Wars?"